A Super Jolt of Nutrition in just 1/4 oz. a day! There is no doubt that Acai is big health news! But as a consumer you want the best possible super fruit juice and the enormous health benefits that come from them. That is why Viva Acai includes both Acai and Pomegranate. Most of us are a little careless about our nutrition habits. We know that we should be eating more fruits and vegetables but we just don't do it. Fortunately, nature has brought us a new breed of nutrition and a simple solution with super fruits. Viva Acai is loaded with essential vitamins and incredible antioxidant power. In fact, Acai and Pomegranate are the top two super fruits in the world. 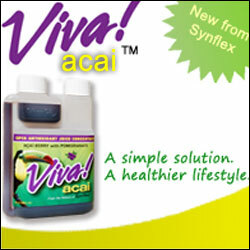 Viva Acai is a powerful jolt of nutrition and antioxidant benefits. The nutrient density of Acai and Pomegranate is the key here. For those of you who are not familiar with the term nutrient density, it means the quantity of nutrients per calorie ingested. In studies published in the Journal of Food Science (May 2007), University of Florida researcher and dietitian Gail Rampersaud reported on her studies of the nutrient density of 100% fruit juices. While this study is good in and of itself, she did not include phytonutrients. Phytonutrients are the organic compounds found in super fruits such as those found in Viva Acai. It is notable that these top two super fruits are rich in antioxidants and anthocyanin, a phytonutrient that provides enormous health potential. Why add Pomegranate to Acai? Pomegranate is a top super fruit in and of itself. There has been a great deal of research done on Pomegranate for its potential health benefits. (To read some of the clinical studies go to www.best-acai.org and click on the clinical studies link.) A review of the enormous number of clinical trials (which are ongoing) will tell you why Pomegranate is part of the bold Viva Acai formula. and, in the case of Pomegranate, the amount of clinical research that has already been carried out on that particular fruit. Acai is now the #1 super fruit in the world and it is generating a lot of publicity in leading publications and in televised reports. Given the large and growing body of clinical evidence that supports the health values associated with using Pomegranate, it is the perfect ingredient to add to Viva Acai. Save even more on multiple bottle orders.